There's nothing wrong with Wilma Sturtz. She's perfectly nice. But nobody cares about nice at Claverford, her middle school. 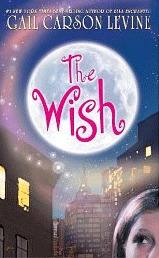 Wilma is left out, forgotten, ignored—until she meets an extraordinary old lady who grants a wish: for Wilma to be the most popular kid in school. Presto! Everything changes. Now Wilma has more best friends than she can keep track of and forty dates to the Graduation Night Dance; and someone is writing her love poetry. What more could she want? Nothing! But will it last? How can Wilma make sure she is never unpopular again? This modern-day fairy tale shows a very real girl in a very unusual predicament, and along the way it reveals some painful truths about whether or not we really want to be liked for who we are.